The American Football League’s Eastern Division title was on the line as the Buffalo Bills met the Boston Patriots on December 20, 1964. The Patriots had won the previous meeting of the teams, blemishing Buffalo’s undefeated record in doing so, and had also beaten Buffalo in a divisional playoff the previous year after the teams tied for first place. Now the Bills were 11-2, after getting off to a 9-0 start, and Boston was right behind at 10-2-1, so once again the winner of the season-ending showdown would advance to the AFL Championship game. Buffalo’s head coach for the third year was Lou Saban, and the Bills ranked at the top of the league in both offense and defense. 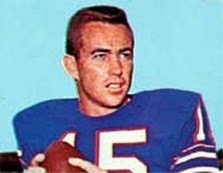 Starting QB Jack Kemp (pictured above) was benched the previous week in favor of Daryle Lamonica, who often relieved if the offense needed a spark, but the 29-year-old veteran was back behind center at Boston. FB Cookie Gilchrist was the key to the strong running attack and there were good receivers in flanker Elbert Dubenion, split end Glenn Bass, and TE Ernie Warlick. The tough defense was especially strong on the line and in the backfield. Rookie PK Pete Gogolak, a pioneering soccer-style kicker, added additional scoring ability. Boston was coached by Mike Holovak and was the hotter team down the stretch, having won five straight contests. 34-year-old QB Babe Parilli was a savvy veteran and flanker Gino Cappelletti the AFL’s most prolific scorer, between catching passes for touchdowns and his reliable placekicking. The defense was a good one and, like the Bills, featured a strong defensive line as well as excellent MLB Nick Buoniconti, who led a linebacker corps known for its blitzing. There was a crowd of 38,021 fans in attendance on a snowy day at Fenway Park. The field was slippery, making the footing treacherous. The teams traded punts to start the game before Jack Kemp threw to Elbert Dubenion for a 57-yard touchdown and Pete Gogolak added the extra point. The Patriots responded with a seven-play, 72-yard drive. In a third-and-ten situation, Babe Parilli completed a pass to split end Art Graham for 22 yards and, three plays later, connected with TE Tony Romeo for a 37-yard TD. However, Boston tried for a two-point conversion and Parilli’s pass intended for Gino Cappelletti was incomplete, leaving the Bills in the lead by 7-6. On the first play after the ensuing kickoff, Kemp again went long for Dubenion (pictured at left), and it resulted in a gain of 52 yards to the Boston 20. Runs by Kemp and Cookie Gilchrist and a pass to Glenn Bass advanced the ball to the three, but after Gilchrist lost a yard on two carries, Kemp’s third down throw into the end zone was intercepted by FS Ron Hall. The Patriots couldn’t move on offense and punted. Once again the Bills came through with a big pass play, with Kemp this time throwing to Ernie Warlick for 44 yards to the Boston 10. This time the visitors didn’t come up empty, with Kemp gaining the last yard for a touchdown. Gogolak’s point after made the score 14-6. 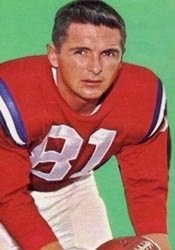 Parilli connected on passes for 15 yards to flanker Jim Colclough and 14 to Gino Cappelletti, but the drive stalled thereafter and the Patriots punted. Kemp threw a pass that was picked off by CB Don Webb, giving the Patriots the ball at the Buffalo 35, but two plays later the Bills returned the favor when FS George Saimes intercepted a Parilli throw. Buffalo put together a long series that covered 65 yards in 14 plays. Kemp completed three passes, including one to Bass for 33 yards, and HB Wray Carlton carried six times. The advance halted at the Boston five and Gogolak kicked a 12-yard field goal with 24 seconds left on the clock. The Bills took a 17-6 lead into halftime. The Patriots went three-and-out and punted to start the third quarter, regained possession on another interception by Hall, but had to punt again. Kemp connected on passes to Bass (pictured below) that covered 38 and 13 yards, but after reaching the Boston 21, a holding penalty backed the Bills up and they had to punt. 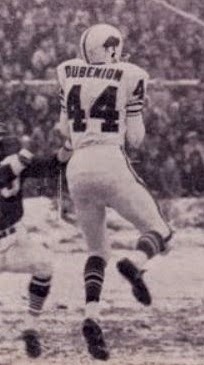 Boston reached the Buffalo 39 on the next series, with the big play a pass from Parilli to Cappelletti for 22 yards, but Cappelletti’s try for a 46-yard field goal hit the crossbar and was no good. As the game headed into the fourth quarter, the Bills had to punt again but regained possession four plays later when Parilli’s pass was intercepted by CB Charley Warner, who ran it back 38 yards to the Boston 17. Five plays later, Kemp scored another TD from a yard out and, with Gogolak’s kick, the Bills were ahead by 24-6. With their backs to the wall, the Patriots struck back as Parilli threw to Colclough for a 43-yard gain and to Cappelletti for 17 yards to reach the Buffalo 11. But the next three passes fell incomplete and FB Larry Garron fumbled after making a catch on fourth down. Saimes recovered for the Bills, who were able to run vital time off the clock before punting it back. Boston scored a touchdown on its next series, with Parilli tossing a pass to Romeo that covered 15 yards, and also threw to Colclough for a two-point conversion. But with less than three minutes remaining to play, it was a case of too-little, too-late. The Bills won by a final score of 24-14. Buffalo had the edge in total yards (380 to 319) and first downs (17 to 15). The Patriots, playing from behind for most of the game, ran the ball only 11 times for 33 yards. Each team turned the ball over three times. Jack Kemp completed 12 of 24 passes for 286 yards and a touchdown, giving up three interceptions, and scored the two short rushing TDs. Glenn Bass had 6 catches for 103 yards and Elbert Dubenion gained 127 yards on his three receptions that included a long touchdown. Cookie Gilchrist rushed for 52 yards on 20 carries and Wray Carlton contributed 31 yards on 15 attempts. For the Patriots, Babe Parilli was successful on 19 of 39 throws for 294 yards and two TDs, and was picked off twice. Jim Colclough (pictured at right) caught 6 passes for 134 yards and Tony Romeo gained 60 yards and scored twice on his three receptions. Larry Garron led the club with 26 yards on 8 rushing attempts. “My everlasting thanks to you for beating Boston,” exclaimed Lou Saban to his players, who awarded him the game ball. Saban had been the original head coach of the Patriots, who fired him during the 1961 season, which added not only an additional element to the rivalry between the teams, but a personal note for the coach. The Bills went on to defeat the San Diego Chargers for the AFL Championship, and did so again the next year. Boston dropped to 4-8-2 before rebounding to contend once more in 1966. As was the case against the Patriots, Jack Kemp wasn’t a high-percentage passer, completing 44.2 percent over the course of the season, but when he connected, the yardage could be sizable. He led the AFL in yards per attempt (8.5) and yards per completion (19.2, which was a full three yards more than the runner-up). He was named to the AFL All-Star Game, as was Elbert Dubenion, who gained 1139 yards on his 42 catches for a league-leading 27.1 average gain. Glenn Bass averaged 20.9 yards on his 43 receptions for 897 yards. Between them, they scored a total of 17 touchdowns (Dubenion with 10, Bass 7). 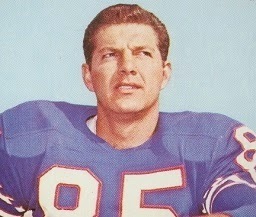 Babe Parilli led the AFL in passing yards (3465) and TD passes (31). Gino Cappelletti, who received Player of the Year recognition, scored 155 points, which were 53 more than Pete Gogolak in second place. He scored seven touchdowns among his 49 catches for 865 yards (17.7 avg.) and also led the league with 25 field goals.